Democratic gubernatorial candidate J.B. Pritzker pulls U.S. Rep. Jan Schakowsky (D-Ill.) into a hug at a meet and greet Saturday. Pritzker and Schakowsky spoke about the importance of voting in November and defeating incumbent Gov. Bruce Rauner. 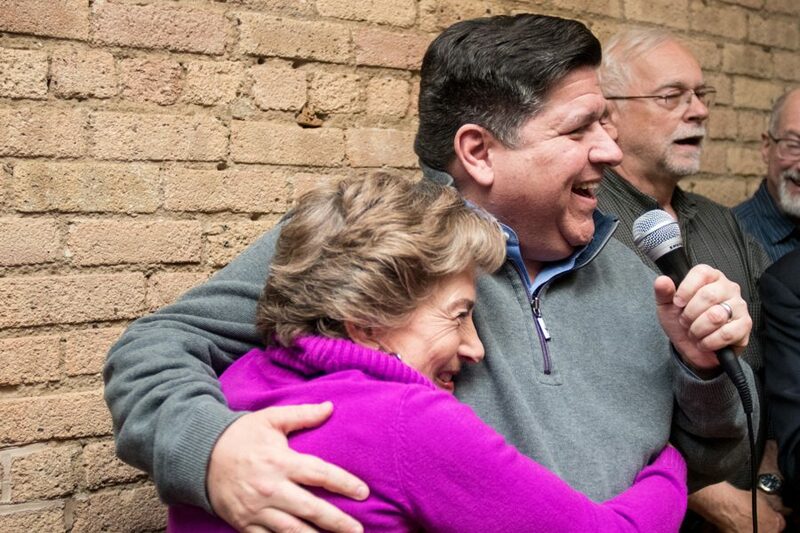 U.S. Rep. Jan Schakowsky (D-Ill.) said Saturday that she is confident Democratic gubernatorial candidate J.B. Pritzker will run a strong campaign leading up to November’s election, and that he will stick to his progressive policy proposals. Schakowsky and Pritzker spoke at a meet and greet, held at a packed Prairie Moon in downtown Evanston, looking to rally supporters ahead of the midterms. Now, he is looking to defeat the incumbent, Republican Gov. Bruce Rauner, in November’s election. Pritzker is running on a progressive platform, hoping to increase wages across the state, provide better access to health care and expand education funding. He stressed the importance of investing in Illinois residents, “the state’s largest natural resource,” and getting people to go to the polls on election night. He and Schakowsky, as well as his running mate, state Rep. Juliana Stratton (D-Chicago), attributed many of the state’s issues to Rauner’s time in office. Since assuming office in 2015, Rauner’s tenure has been controversial, and he has consistently ranked among the country’s least popular governors. Pritzker also emphasized funding for higher education and said that under Rauner, funding for education in Illinois was consistently cut, hurting students and the economy. Pritzker said he wants to focus on making college affordable for residents, in hopes of retaining students who may otherwise leave the state. Though he wants students to feel like college is attainable, Pritzker said he also intends to provide funding for programs to serve those who choose not to attend — like vocational training in high schools. “We’ve got to lower the cost of college tuition in the state of Illinois, and we’ve got to make sure that people are able to lower the cost of their college debt to the extent they’ve already accumulated some,” Pritzker told The Daily. Pritzker said that as governor, he would want the state to support young people trying to start their own businesses by helping them with loans, technical assistance and mentorship opportunities. Firouz Niazi, an Evanston native and freshman at the University of Chicago, said he attended Saturday’s event to learn more about Pritzker’s platforms, and was happy for the chance to hear from a candidate directly. Schakowsky said she purposefully did not support a candidate during the primaries, waiting until after the March election to back the Democratic candidate. She said the start of the general election marks a watershed moment and the right time to make an endorsement.